This image was originally posted to Flickr by Gage Skidmore at https://flickr.com/photos/22007612@N05/6236336431. It was reviewed on 25 August 2015 by FlickreviewR and was confirmed to be licensed under the terms of the cc-by-sa-2.0. The Ancient Order of Hibernians was established in 1836 to protect and defend Our Holy Mother, the Roman Catholic Church, from the violence and bigotry of anti-Catholic nativist mobs. While violent physical attacks on our churches have become largely a thing of the past, bigotry and disdain for the Catholic Church has not vanished; it hides in the shadows where it nurses on the darkness until its next opportunity to spread the poison of prejudice. 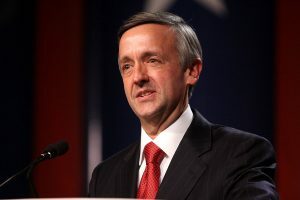 On Friday evening, October 21, President Trump through twitter promoted the work of Dr. Robert Jeffress, a megachurch pastor of First Baptist Church in Dallas, Texas. In his tweet, the President lauded Dr. Jeffress book, A Place Called Heaven: 10 Surprising Truths About Your Eternal Home, calling the book “great” and effusively praising Dr. Jeffress himself as “a wonderful man.” Many Catholic Americans would not concur in the President’s veneration; there is nothing “wonderful” in Dr. Jeffress’ well documented hatred of anyone who is not an evangelical Christian. It is in truth Jeffress who has proven the most counterfeit in his abandonment of Christian tolerance; wallowing in the muck of bigotry and resurrecting the old hatreds that threatened the very fabric of this nation. His pronouncements are in the tradition of the screeds penned by American “Know Nothings” against “Papist influence” each time a fresh surge of Catholic Irish immigrants arrived in this country or throughout the 1928 presidential campaign of Al Smith as the first Catholic nominee of any major party and resurrected again during the campaign of John F. Kennedy. It is profoundly troubling that Jeffress’ comments and public stances do not appear to have caused the President any qualms. Jeffress’ effusive praise and encouragement to evangelicals to be open-minded about Candidate Trump in 2016, while simultaneously promoting his narrow-minded intolerance of Catholicism, have apparently earned him a prominent place near the head of the table. The Ancient Order of Hibernians does take notice of the despicable comments made by Dr. Robert Jeffress toward our Holy Mother Church and the fact that he has never apologized or attempted to distance himself from them. People holding such bigoted and unsanctified views towards others of different faiths are in contradiction not only with the basic tenets of Christianity, but also the founding principles which make our nation great.